By shortening and lengthening just one of their eight arms at a time, octopuses can propel themselves in any direction, but there is no regular rhythm to their movements, according to a study published last month (April 16) in Current Biology. Last year, a team of researchers at the University of Jerusalem showed that octopus arms can recognize and avoid octopus skin, helping to explain why their graceful, gangly arms don’t become tangled as the animals swim. Now, the same scientists have used high speed video of the cephalopods’ undersides to explain how the animals move without a skeleton. The researchers found that the octopus shrinks or extends one arm in a single direction to create thrust, but does not bend or pull the arm in another direction. “The octopus only has to decide which arm to use for the pushing - it doesn’t need to decide which direction this arm will push,” study coauthor Guy Levy told BBC News. Unlike most animals, the octopus does not have to turn its body to change the direction of travel because its arms can be spread out in any direction. “It simply chooses other arms to push the body, and the direction is changed automatically,” Levy told Live Science. In another apparently unique feature of octopus locomotion, there does not seem to be a discernible pattern of coordination of movement among the animal’s eight arms. 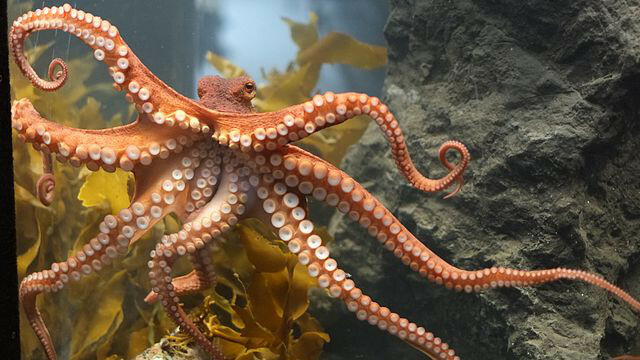 Overall, the relatively simple strategy that propels the octopus in any direction may suggest that motor control and body shape evolved together, an example of the principle of “embodied organization,” the researchers wrote in their paper. 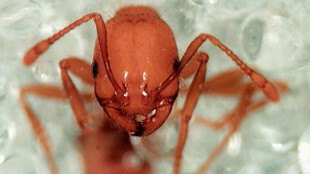 When constructing tunnels, fire ants (Solenopsis invicta) clear soil out of the way by gathering fine-grained clumps of dirt with their forelimbs, mandibles, and antennae in a process similar to rolling a snowball, according to a study published this month (May 6) in The Journal of Experimental Biology. To understand how fire ants—which are native to South America—have successfully made their home in the U.S., Australia, and China, where the size of dirt particles and the soil moisture can vary considerably, researchers at Georgia Tech tested the ability of small colonies of 100 ants to build tunnel systems in 14.5-centimeter-deep tubes filled with a single size of silica beads. Varying both bead size and moisture, the researchers found that the ants were successful at constructing tunnels in simulated “soil” of any particle size—including those as large as the ants’ heads—as long as the beads were neither completely dry or fully saturated with water. X-ray images of the tunnels revealed that the most structurally sound tunnels were built in soil of intermediate moisture level. The researchers then filmed the ants manipulating the beads, finding that the animals used different construction approaches depending on the size of the particles. While the ants moved large particles out of the way one by one, they rolled smaller beads together into larger balls before carrying them up the tunnel. These different strategies might account for the successful spread of the ants in different soils. “It is just mind-blowing how they can dig so well,” study coauthor Daniel Goldman of Georgia Tech said in a statement. 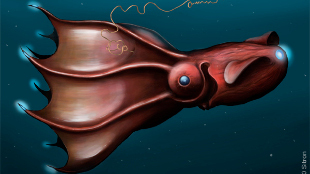 Unlike many of their cephalopod relatives, female deep sea-dwelling vampire squid (Vampyroteuthis infernalis) can spawn more than once by releasing small batches of eggs periodically throughout their lives, according to a study published last month (April 20) in Current Biology. Researchers from the Helmholtz Center for Ocean Research in Germany, the Centre for Environment, Fisheries and Aquaculture Science in the U.K., and the Monterey Bay Aquarium Research Institute in California dissected 43 female vampire squid that had been caught off the coast of southern California since the 1960s and preserved at the Santa Barbara Museum of Natural History. The scientists found that 20 of the adult females had released eggs but still had immature egg cells inside their bodies. The best-developed specimen, weighing a pound and measuring four inches in length, had released at least 3,800 eggs in her lifetime and still had 6,500 immature eggs in her body. Estimating that the average spawning releases 100 eggs, the scientists hypothesized that a squid could spawn as many as 100 times. The dissections also revealed that unlike true squids, the vampire squid—the only member of its order —has a gonadal resting phase when the ovary has no developing eggs, and is capable of reabsorbing eggs into the ovarian tissue to save energy when resources are lean. These energy-saving strategies are in line with the limited diet of the vampire squid, which subsists on floating plankton and decaying material at depths of 500 meters to 3,000 meters (1,630 feet to 9,800 feet). “By reproducing in multiple cycles, it may allow vampire squid to make use of its low-calorie food source,” study coauthor Henk-Jan Hoving of the Helmholtz Center told New Scientist. The new information sheds light on the mysterious reproductive cycles of the vampire squid, whose mating has never been observed. Although it is not known how long the gonadal resting phase lasts, the scientists estimated that the squid spends three to eight years of its life as an adult, much longer than its shallow-water relatives that only live six to 18 months. “I don’t think this slow pace of life allows one big reproductive spawning event,” Hoving told Science. Memories of a stressful swim appear to make rats more likely to help conspecifics escape a pool, although even those without previous water experience tended to rescue a distressed rat before partaking in a chocolate treat, according to a study published last week (May 12) in Animal Cognition. Previous studies had demonstrated the tendency of rats to help their fellow rodents out of uncomfortable restraints or situations like being stuck in a narrow tube. To further investigate what these helping behaviors might mean for the presence of empathy or altruism in rats, researchers at Kwansei Gakuin University in Japan tested pairs of the animals under three distressing conditions. 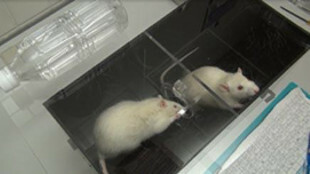 In the second experiment, when both rats were in dry areas, the rat that could control the door made no attempt to rescue the other, indicating that the distress of the other animal was an important factor in motivating the opening of the door. The final experiment gave the potential helper rats a choice of opening a door for a food reward of chocolate or rescuing the stressed swimmer. Strikingly, most rats chose to open the door to let in the wet rat first before going for the chocolate. Male broad-horned flour beetles (Gnatocerus cornutus) woo and mate with females that have been in contact with a few other males, but are less likely to attempt to mate with females that have had contact with many other males, according to a study published last month (April 29) in Behavioral Ecology. 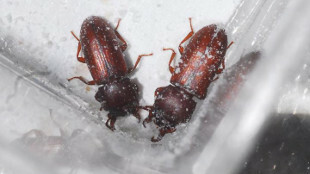 Flour beetles and other insects such as Drosophila and crickets transfer chemicals known as cuticular hydrocarbons (CHCs) during sexual contact. To test whether the presence of CHCs on females impacted male mating behavior, researchers from the University of Exeter in the U.K. and Okayama University in Japan gently shook virgin females together with one, three, or five virgin males to transfer the CHCs without mating. The researchers then introduced the scented females to different virgin males and observed the males’ courting behavior for 40 minutes. During courting, the male mounts the female and drums his leg along her abdomen for as long as 10 minutes until she allows him to mate with her. However, the researchers found that if the female had already been exposed to more than three males, the potential mates made fewer courtship maneuvers. In a follow-up experiment, the researchers tested the effect of the number of males the female had previously met on mating. The scientists froze mated female insects and removed and counted the sperm in their reproductive tracts, finding that males ejaculated significantly more sperm into females that had been in contact with three other males when compared to females who had no previous contact with males.